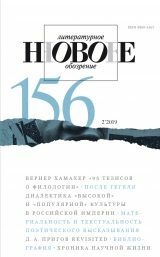 NEW LITERARY OBSERVER (launched in 1992) is the leading Russian interdisciplinary journal studying Russian culture in a global intellectual context as well as promoting contemporary Russian thought in the international cultural community. The main task of NLO is to seek and stimulate new approaches to studying human nature and culture, to reflect on the new challenges and rapidly changing status of academic institutions with the final aim of radically modernizing the field of human studies. The NLO authors are major experts from nearly all areas of the humanities: history, philosophy, cultural studies, sociology, literary criticism, cultural and historical anthropology etc. – Practice: articles, essays and interviews on the evolution of literary genres and texts in the contemporary multimedia world; extensive bibliography of the current fiction and non-fiction; chronicles of major academic and cultural events (conferences, round-tables, book presentations, literary prizes etc).